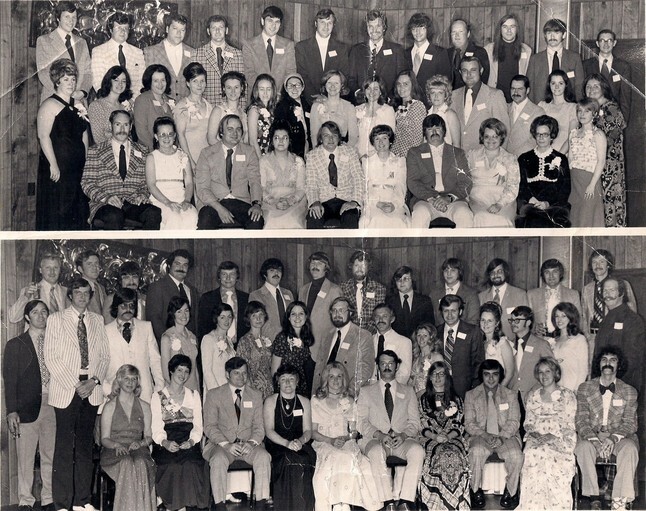 10th year reunion top picture, 1st row Rich Keniston, Cheryl Thorburn, Bruce McAlpine, Susie Skinner, Billy Hamilton, Janith Stephens, John McPhee, Joanne Semple, Brenda Emerson, Carol Tucker. 2nd row: Nancy Johnson, Beverly Patton, Carolyn Brown, unknown, unknown, unknown, unknown, Nancy Neuman, unknown, unknown, Marie Gowen, George Tardiff, Robert Lengel, unknown, Randi Kolseth. 3rd row: Lee Nightingale, Whiting Rice, Warren Groth, Robert Metcalf, Mike Martin, George Gehman, Chuck Hervey, Paul Wisniewski, Glenn Jillson, Arnold White, unknown, Robert Boone. Bottom picture,1st row: Carol Fillmore, Valerie Gould, Cliff Arnold,Bonnie Keenan, Annette Prefontaine, Bob Perry, Mary Ellen Frawley Ed Movsessian, Carol Pezold, and David Dardi. 2nd row: George Magnan (Annette's husband), Vinnie Megna, Mark Sheehan, Janet Hawkins, Nancy Atwood, Mary Jane Presslet, Mary Birmingham, Eric Christensen, Dave Heylin, Janice Henry, Kenny Oliva, Susan Wicklund, Rich Knauber, Dolly Schaefer, and Steve Rowland. 3rd Row: Ed Gorham (Dolly's husband), Jack Killarney, Paul Gianetti, Steve LeVangie., Paul Lasky, Bernie Salles, Mark Allen, Ken Sundquist,Bob Peloquin, Leo Nichols, unknown, Art Bremilist, and Brad Smith.